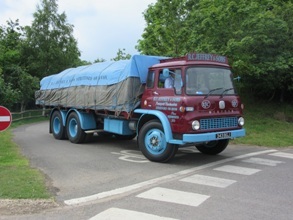 Over 300 classic and vintage lorries will go on display when the British Motor Museum hosts the 'Classic and Vintage Commercial Show' on Saturday 10 & Sunday 11 June. This must see show features a diverse selection of vehicles built before 1997 such as the light Transit van's through to the mighty 8 wheelers that were on regular haulage duties plus a couple of heavy haulage tractors as well. Now in its tenth year, the event is one of the largest classic commercial shows in Europe. 2017 marks the 50 year anniversary of Volvo Trucks in the UK which will include a private event at the Warwick Headquarters on Saturday 10 June. After the celebration the vehicles will arrive at Gaydon late in the afternoon. There will be a large area in the "camping" car park at the top of the site for the Volvo's to be displayed. The show also attracts a number of overseas visitors, including entries from Europe which add to the diverse selection of vehicles to view. These will include a large number of Leyland T45s, arranged informally by Diesel Dickson from Scotland and Michael Lacey from Essex plus a number of Dutch Leyland T45's. For enthusiasts restoring vehicles there is a large commercial auto-jumble selling vehicle spares, photos, brochures, models and all manner of items associated with historic commercial vehicles. There is also an indoor model show within the Museum with over 160 tables of models on display. Whether they are kit or scratch built, these models add a different aspect to the show and highlight an array of different scaled models. Once again Kelsey Media are supporting the show and will have their own trade stand selling their publications such as Classic and Vintage Commercial magazine, Classic Van and Pick up magazine and Vintage Roadscene. For those that want to make a weekend of it, camping is available enabling visitors to spend more time to look around the Museum and Collections Centre, home to the museums reserve collection and Jaguar Heritage Collection. Tom Caren, Show Manager at the British Motor Museum stated "Now in its tenth year the show is as popular as ever and is a fascinating nostalgia trip, even for those not interested in commercial vehicles. Over the weekend we're expecting around 4,000 visitors to attend and around 300 vehicles on display for everyone to enjoy". A 1 day advance ticket costs £14 for adults, £9 for children and £12 for concessions. Tickets on the day are slightly more expensive; please see the website for full details. Camping pitches start from £25 and include the use of the shower and toilet facilities.